There are countless things to do in Sri Lanka. And as the first South Asian country that Rachel and I visited together, month-long trip was very special. 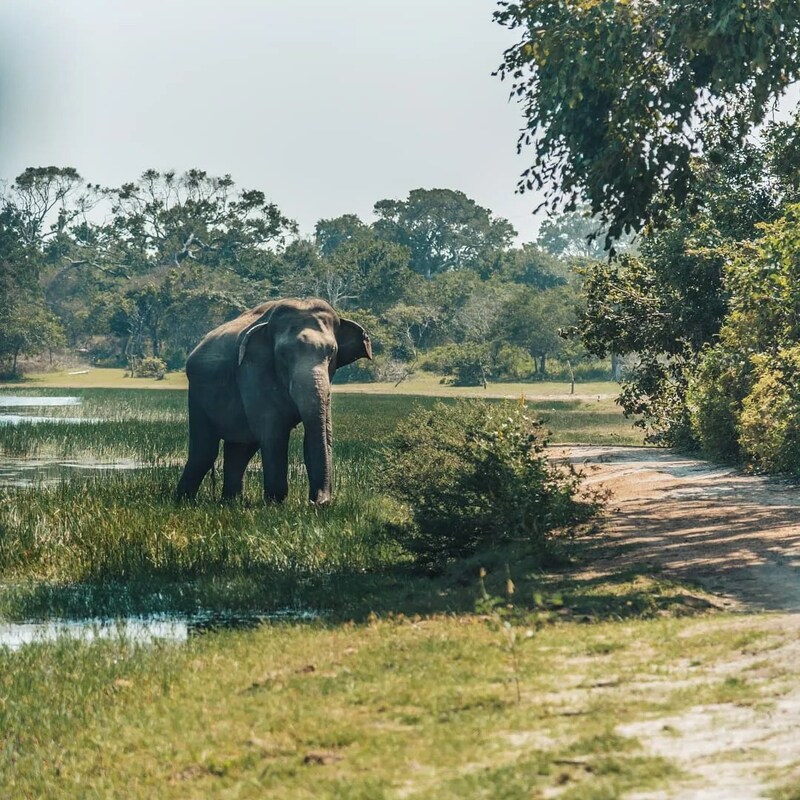 Today, we want to show you 50 things to do in Sri Lanka and why this is a country that needs to be in your bucket list. Make sure you let us know what you think in the comments and if you have questions, we’d love to hear them too. 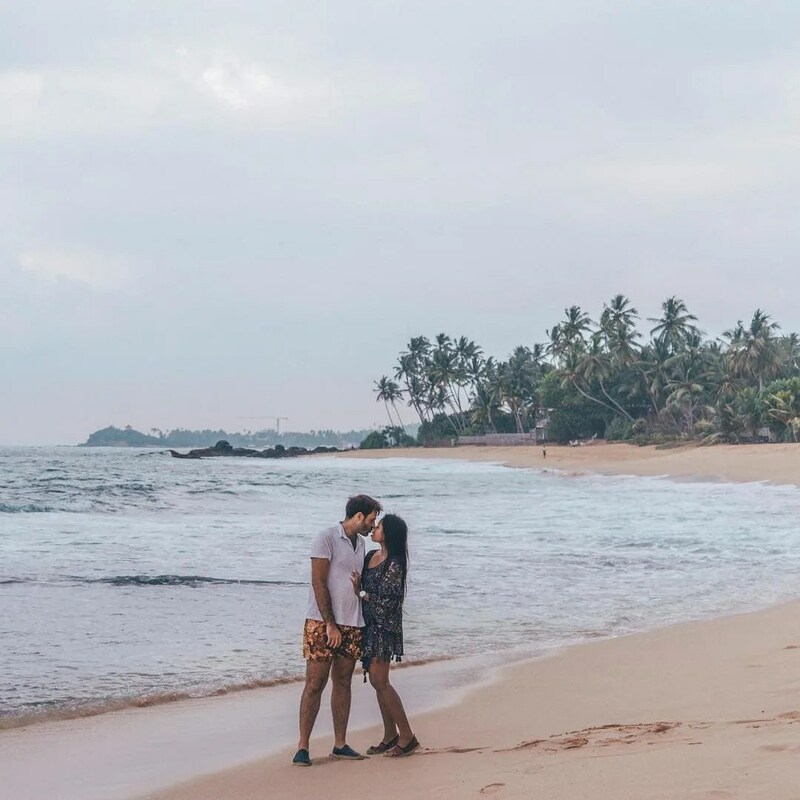 Read here 10 Most Instagrammable places in Sri Lanka! Read here our favorite 25 Sri Lanka Tourist Spots! Citizens of the Maldives, Seychelles and Singapore get to visit Sri Lanka visa-free for at least 30 days. On the other hand, those coming from most African nations need to get their visas beforehand. Other countries not specified are asked to obtain their visas upon arrival and are required to complete their electronic travel authorization (ETA) prior to their trip or as soon as they arrive in Sri Lanka. It’s easy to complete this application so better do it before visiting Sri Lanka to avoid any hassle. There are many airlines to choose from when traveling to Sri Lanka. Emirates Airlines has daily connecting flights from Dubai and Singapore, Qatar Airways travels from Doha and Air Asia operates from Kualal Lumpur. All these flights and many others head to Colombo, Sri Lanka. Those traveling to New York can get 3-stop flights for as cheap as 530 USD. Make sure to check SkyScanner.com for the lowest air fares available! Because of the proximity of the “Island of Dharma” to the equator, Sri Lanka has a pretty stable climate without any major weather disturbances, though the weather does vary from the east to the west coast. Those traveling to the east coast cities of Trincomalee and Kalmunai, the best time to visit Sri Lanka is from April or May until September. On the other hand, visitors headed to Colombo or anywhere on the west coast are advised to book their trips from December to March. Watch out for monsoon season, which is experienced from May to July in the Southwest and from October to January in the Northeast. You can always check here for the latest updates on Sri Lanka’s weather condition and the best time to visit Sri Lanka. Like many Asian islands, you can go backpacking Sri Lanka with much less than what you’d spend in Western countries. Everything in Sri Lanka is a lot cheaper from food and beer to hostels and transportation. A meal in Sri Lanka can go for as low as $1-3 USD while beer can be bought for a dollar. Other drinks to try are Sri Lanka’s fresh fruit juices that also cost around $1 USD. Bus or train rides will take around $3-5 USD from your budget each trip, but this already covers long distances and intercity travels. All in all, you can travel to Sri Lanka and spend around $20-30 USD per day. This includes your food, accommodation and transportation and only depends on how much you’re willing to spend or save each time you take out your wallet. Your budget balloons whenever you eat at fancy restaurants, stay at luxurious hotel rooms or ride first class, so make sure you manage your money well. You can find accommodation in a budget for $10-15 USD a room in a guest house or Airbnb similar prices. Click here to get $30 USD credit if you sign up with this link in your first booking. 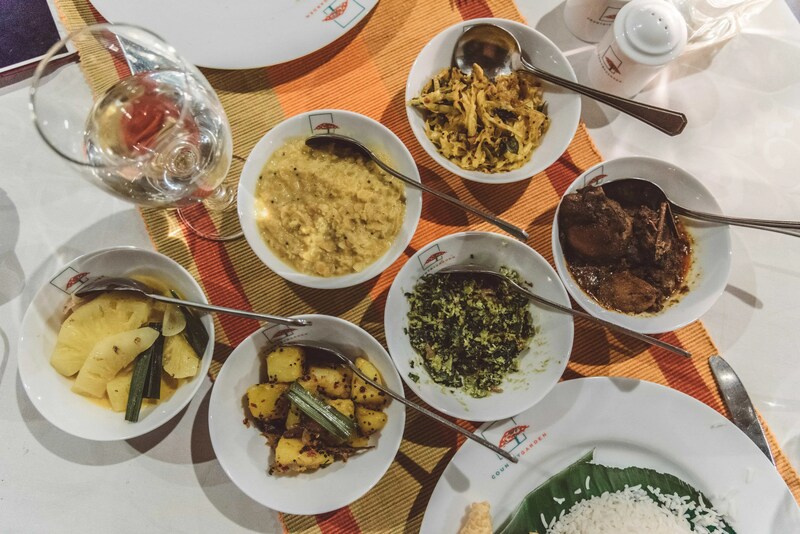 Mid-budget options can be found easily in Sri Lanka, with meals going for $20-50 USD. There are also luxury hotels that cost around $80 USD a night. Click here to find your best deals in Sri Lanka with Booking and Agoda! As always, we will give you our very own guide to sleeping for free on your travels with locals in Sri Lanka! 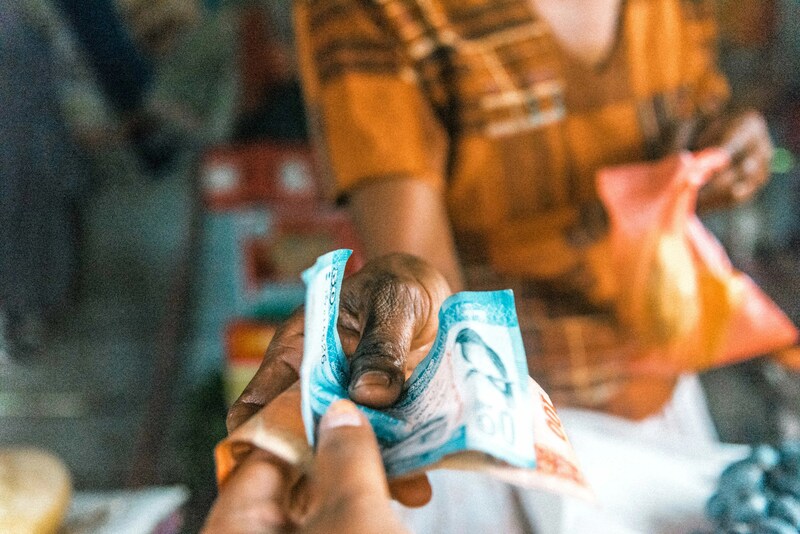 For a more comprehensive budget guide when traveling around Sri Lanka, check out our post here. 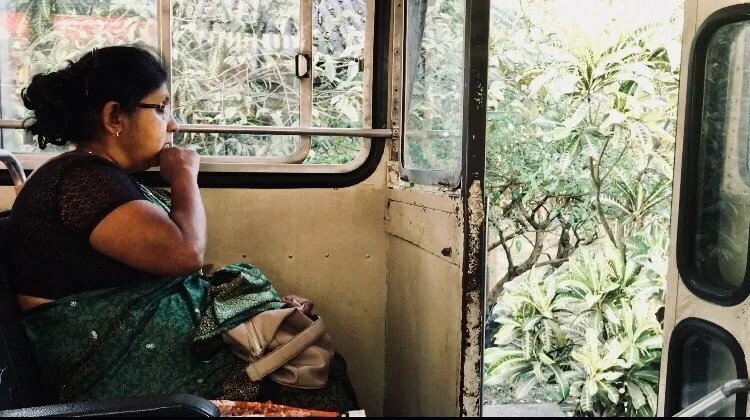 There are many ways to go around Sri Lanka on public transportation or even by yourself. The way you travel usually dictates the kinds of adventures you will have. Whichever vehicle you may choose, just remember to enjoy the ride as much as the destination. Those who have explored other Asian nations like Thailand or the Philippines may be familiar with the tuk tuk, a three-wheeler taxi. It is the cheapest and most convenient way to cover short distances in Sri Lanka. Some of these taxis are not metered so be wary of drivers that rip off foreigners, though. Keep in mind that a ride only costs around 60 to 75 LKR per kilometer. Another great way to experience the tuk tuk is by renting your own! If you can rent a tuk tuk, you can definitely rent a car in Sri Lanka too. Some cars come with their own multi-lingual and culturally knowledgeable drivers to make your travels even easier. Those who want to drive on their own should remember to ensure an international license. Here’s a tip: While there are several rental companies at the airport, renting from other companies outside the establishment are much cheaper. Surprisingly more inexpensive than a lot of tuk tuks are the taxis all around Sri Lanka. Because most of the trips are metered, it’s easier to see how much you really need to pay. Some taxis even offer day packages at around 40 USD for 8 hours or 80 kms. There are budget taxis that are cheaper than regular ones but better than tuk tuks. Uber and Grab are also available in Sri Lanka. There are different types of buses all around Sri Lanka. A ride on regular buses costs around 12 LKR for 10- to 15-minute trips. Luxury buses are more comfortable and have conductors that speak better English. There are also super luxury buses that travel on limited routes but are sleeper buses that go from Colombo to Galle or Kataragama. Traveling via bus is a convenient way to go around Sri Lanka and allows you to interact with the locals. Just make sure to always be alert as most drivers drive really fast. Just hold on properly wherever you can! And take note that you might be standing on the bus for quite a while since these vehicles always get full. A comfortable but inexpensive way to travel the island of Sri Lanka is to ride the train. Its the best way to take in Sri Lanka’s picturesque landscapes. In fact, there are even Observation Cars for tourists to enjoy. There are also luxury express trains for those who want to arrive in their destinations much faster and in style. A 7-hour air conditioned luxury express train ride to Jaffna from Colombo Fort costs around 1,500 LKR while a third class seat costs 500 LKR. Traveling third class isn’t as awful as it sounds and is a great way to save money on transportation. Third class is the best way if you didn’t book in advance. It can be crowded but you will certainly love the views! 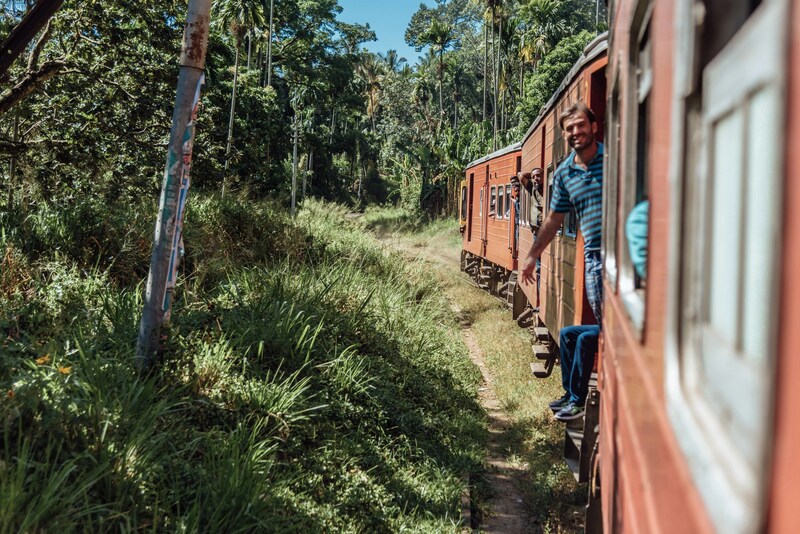 One of the most popular bucket list items in Sri Lanka is the Insta-famous train ride from Kandy to Ella, or vice-versa. We hopped on for a ride for 7 hours but we couldn’t take as many pictures as we liked as the train was too crowded. The view of the Sri Lankan landscape from the train was so awe-inspiring, and the tea plantations that you pass by for hours and hours were great as well. Unfortunately, however, we forgot to book our train trip in advance so we had to ride second class—that means you could spend a few hours on your feet, depending on your luck. We recommend taking the route from Ella to Kandy due to its less-crowded nature compared to other routes. It is especially great if you’d like to take many splendid photos of the landscape. You can experience this spectacular adventure for 7 hours at the price of $2-3 USD. For this adventure, we chose to explore the Kumana National Park—just a few kilometers away from Arugam Bay—in a Tuk Tuk Safari. We were graced with the sight of fascinating creatures such as peacocks, crocodiles, deer, and buffalo. We even ran into an elephant along the way, which prompted us to stop for a few minutes since elephants are apparently dangerous when they’re afraid, like when they hear the noise of a tuk tuk. Still, we had an amazing time marveling at the humongous beast from a few meters away. You better believe we didn’t leave without taking snapshots and videos for keeps! Now, I know what you’re thinking. Pineapple curry? For dessert?? But why?! Well, this may come as a surprise, but it was actually very delicious. We’ve never heard of this delicacy before this trip, but we have to say that it was so good that we tried it not only once but a few more times during our stay. That’s how delicious this unlikely food combination is. 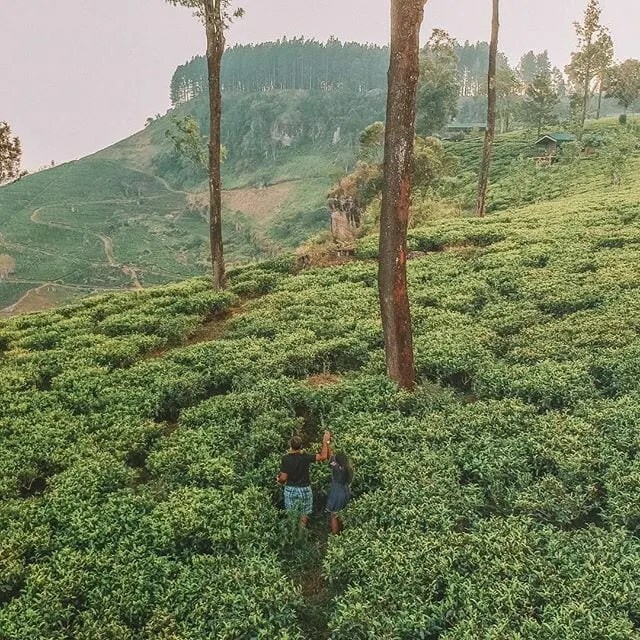 Visiting a tea plantation is definitely a must for those traveling in Sri Lanka, even if you’re not really big on tea. Just the experience alone of hiking around the area and having the opportunity to witness how hard the locals work to collect tea leaves is worth the visit. You will find some of these plantations around the Nuwara Eliya area, which is composed of a stunning landscape. But make sure to bring a comfy jacket or sweater because the mountains are close to 2000 meters above sea level, so it’s really cold. Click here to book your accommodation before your next trip to Sri Lanka! 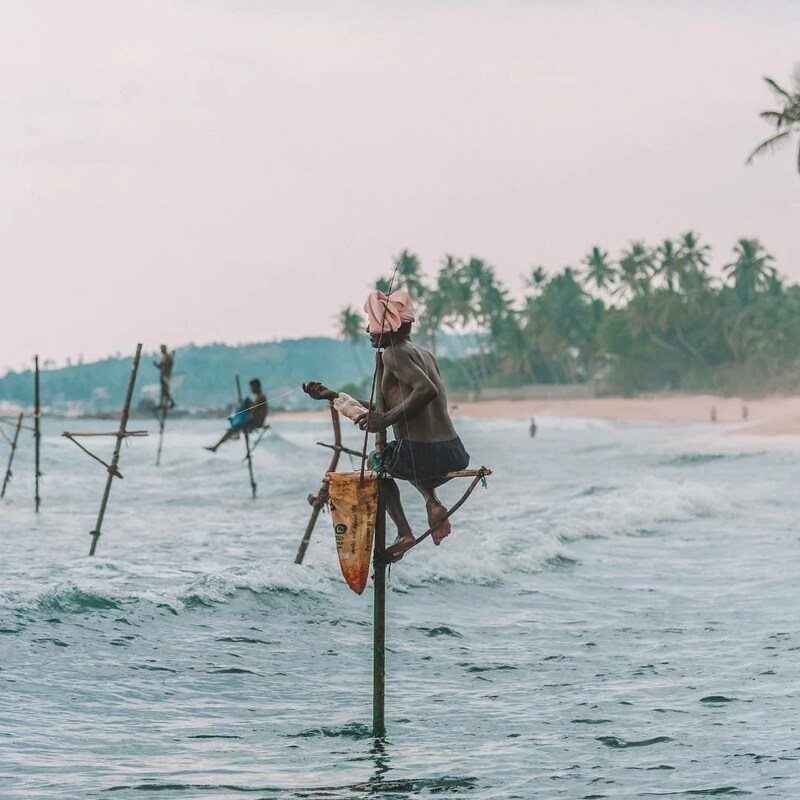 One of the other popular attractions in Sri Lankan beaches is checking out this unique method of fishing called “stilt fishing”, which is basically fishermen standing on sticks to catch fish. We witnessed this in different places and despite of it being so “touristic” of us, we decided to go ahead and take their photos. Dalawella Beach (where the Palm Tree Swing is) and Koggala Beach are some of the well-known places where you can see stilt fishers. Sri Lankans love drinking arrack. It’s a very strong alcoholic beverage produced in the country and also in South India. Made from fermented coconut flower sap and sugarcane or fruit, this stuff is actually very cheap but also very intoxicating, so ease on the shots with this one! Side note: the Filipino term for “arrack” is, well, alak. Also, its Pinoy counterpart is lambanog. Apart from consuming an abundance of local dishes, we also tried some local beers. 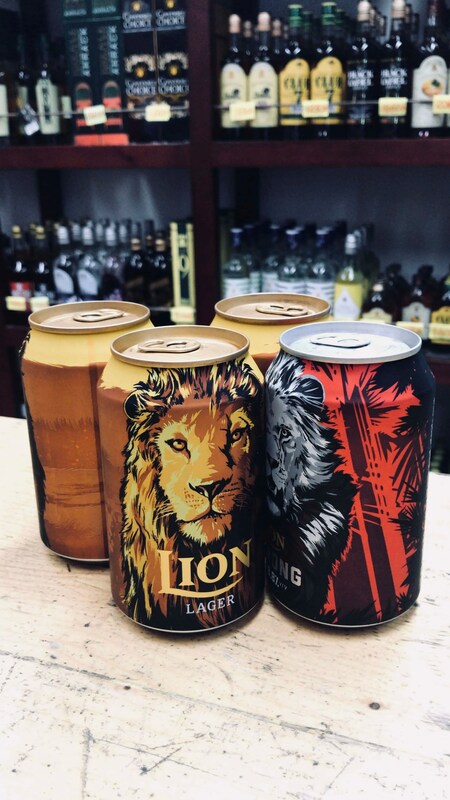 Our top pick was Lion Beer Lager and Lion Beer Strong, both of which we liked so much. These cost about $1 USD, which pleased us as we got to drink such good beer for only a small price. One interesting thing that we learned: you can only purchase and take home beers from wineries and big supermarkets. However, beer is also served in bars and restaurants in Sri Lanka’s tourist spots. We tried to stray from those areas so we kinda had a hard time finding a place to buy beer. There are a number of places where you’ll be able to see turtles in Sri Lanka. One is a turtle sanctuary near Unawatuna, but the one that we went to was in Hikkaduwa Beach, close to the seashore. You can watch giant turtles swimming around, and you don’t even need to go too far to actually catch a glimpse of them. As seen in our other articles, we really love Couchsurfing. In fact, this is how Rachel and I met. This is the reason why we love having these experiences when travelling the world. We stayed in in a local house in Colombo and we got to try different local dishes here, thanks to our amazing hosts Budhi and Su. We also got to visit some places that we couldn’t have otherwise gotten to had it not been for their advice. 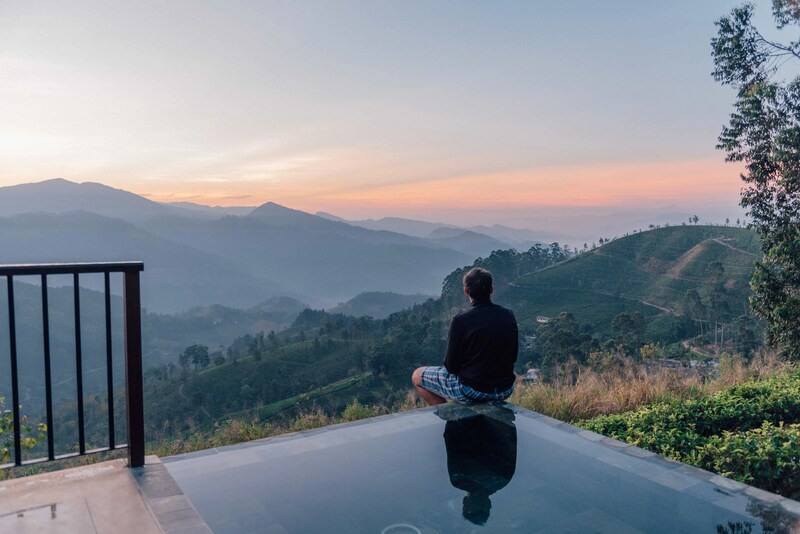 Needless to say, they provided us with a perfect introduction for our trip around Sri Lanka—with great food, and only the best recommendations for our travel itinerary. Short for “glamorous camping” for those of you who are scratching their heads right now, glamping is the new cool traveling fad. It was in the country of Sri Lanka that we had our first glamping experience, and it left a very good first impression on us. Our favorite was the one that we had in Maldukelle Tea and Eco Lodge, just an hour north of Kandy. 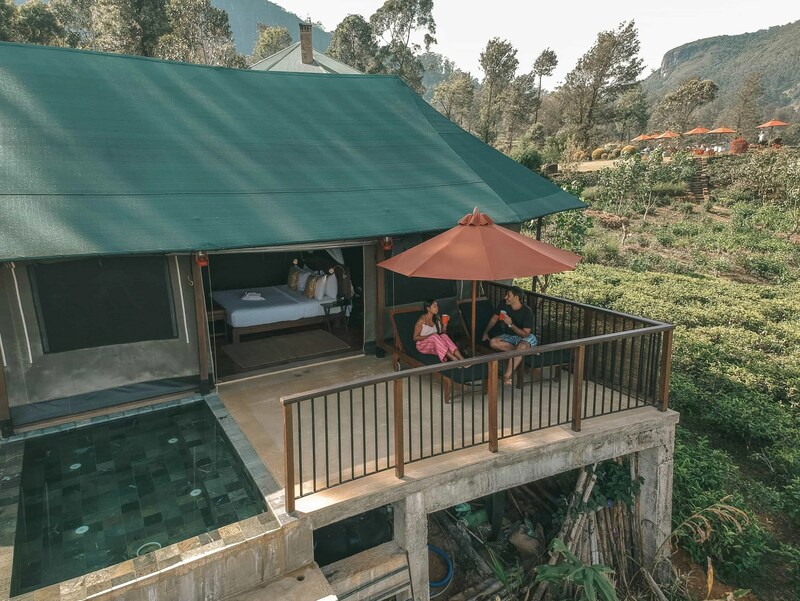 You’ll definitely enjoy the amazing sights from the tea plantation, which provided us with the best tea we’ve ever had and all the luxury that we needed. Our “tent” had its own swimming pool, a bathtub, high-speed internet connection, and most of all, insanely fantastic views. The service was great; the staff made us feel so special and at home. We also have to give a big thanks to Ruzaika, who is one of our followers, who invited us and arranged everything to our maximum enjoyment in Madulkelle. Click here, if you want to enjoy our favorite place to sleep in Sri Lanka. Looking for accommodation in Sri Lanka? Check here and book the best places to stay in Sri Lanka. We aren’t really surfers, but a lot of other people in Sri Lanka were, as seen in the beaches that we came to. There was this one place where we stayed for a few days and really liked where you can go surfing: Arugam Bay. It is located in a fisherman town in the eastern part of the country which was very quiet during the low season. To get there, you have to take a bus from either Colombo or Matara and it would take you about 7 hours to reach the destination. Prices start at $5 USD. Man, transportation is very cheap in Sri Lanka! 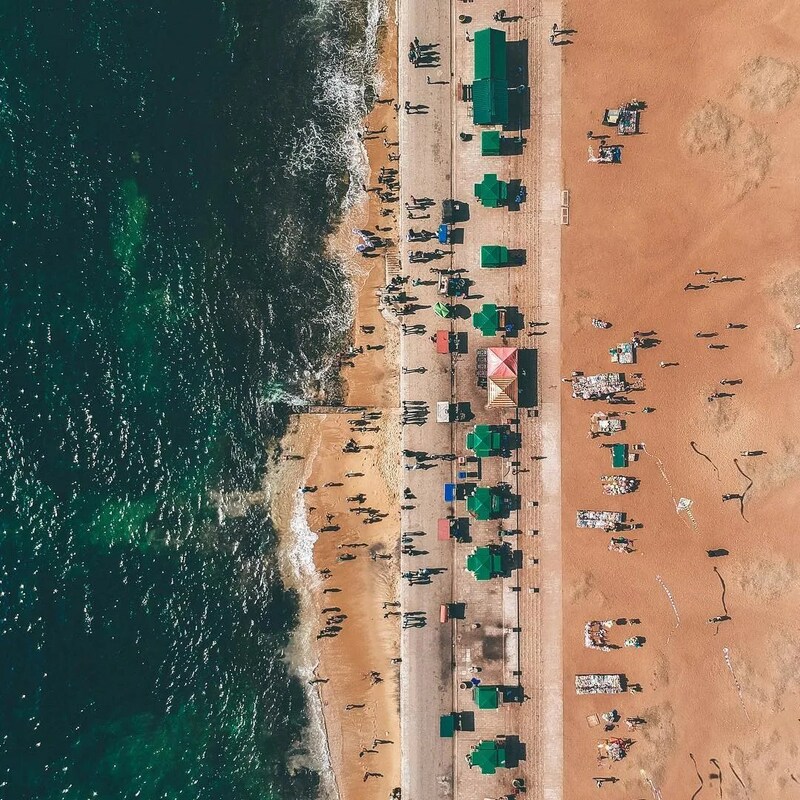 Colombo beaches tend to get super crowded during the weekends, with mostly locals taking this time to relax and go for a swim. We spent one day in the city and were so astounded to find out that the beach was just nearby. That being said, the atmosphere was great, mostly due to the local street food vendors, and we had fun shooting with our drone as well. The Sigiriya (or Sinhagiri) rock fortress is located in the Central Province of Sri Lanka, and is a long climb spanning almost 2 hours, requires climbing 1200 steps, and costs $30 USD. The views that you’re going to see once you reach the top are one of a kind, so I’d say that’s a fair deal. The town of Polonnaruwa is located in the North Central Province in Sri Lanka and remains as one of the best archaeological relic cities in the country. You can visit temples and the many monkeys that dwell here, if that’s your idea of a fun experience. Anuradhapura is the major city of the North Central Province and is a UNESCO World Heritage Site. This place is most famous for the well-preserved ruins dating back to the ancient Sri Lankan civilization. It’s a real treat if you’re interested in temples and other historical sites, not to mention a great place for strolling around on a bicycle or motorbike. 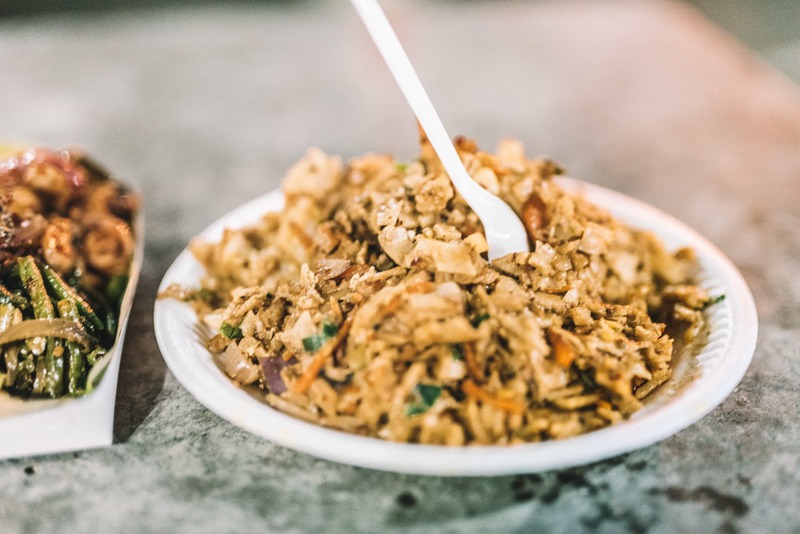 Kothu was one of the best dishes that we had and we made sure that we got to eat it for dinner every day. There are different ways to enjoy this food: vegetarian, chicken, and/or parotta mixed with vegetables and meat if you want. We had a blast watching how noisily this dish is prepared. By the way, kothu only costs around $1-2 USD. Athulya Villas (near Kandy) made it a point that they provide us with luxury the best way that they can. 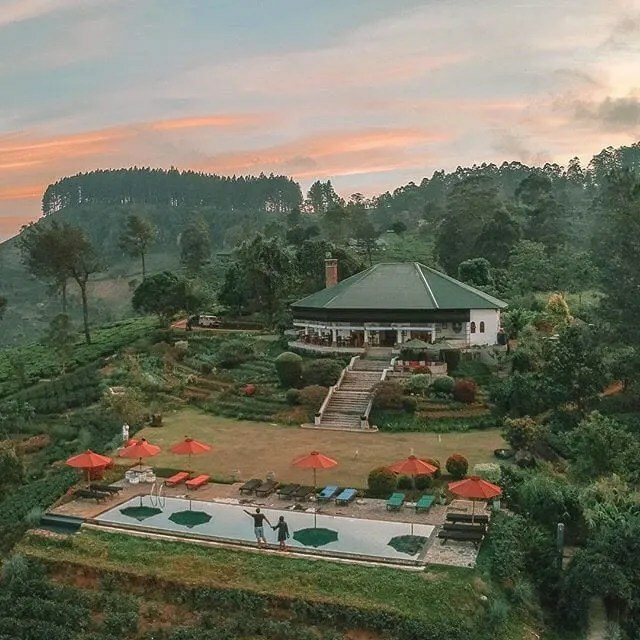 There are only 8 small villas, but the place is really nice and naturalistic, with a great view of the lake and the area around the area of Kandy. The restaurant in the villa is a colonial structure where we tried some local spices and curry that were extremely delicious. The best one for us was—yes, you guessed it—pineapple curry. If you want to have an awesome experience in Athulya Villas, book your stay here. For more accommodations in Sri Lanka click here. You can book yourself a room at a hotel, but you can also stay in a local guesthouse when visiting Sri Lanka. Prices range from $10-15 USD depending on the season, and it may also include breakfast and a private bathroom. The guesthouses are clean and comfortable, and most of them have Wi-Fi—perfect for those who are traveling on a budget. If you want to try AirBnB, you can click here to get a discount on your first booking! Click here and get the best deals to book guesthouses in Sri Lanka. 19. Taking a Stroll on a Tuk-tuk—For a Price! 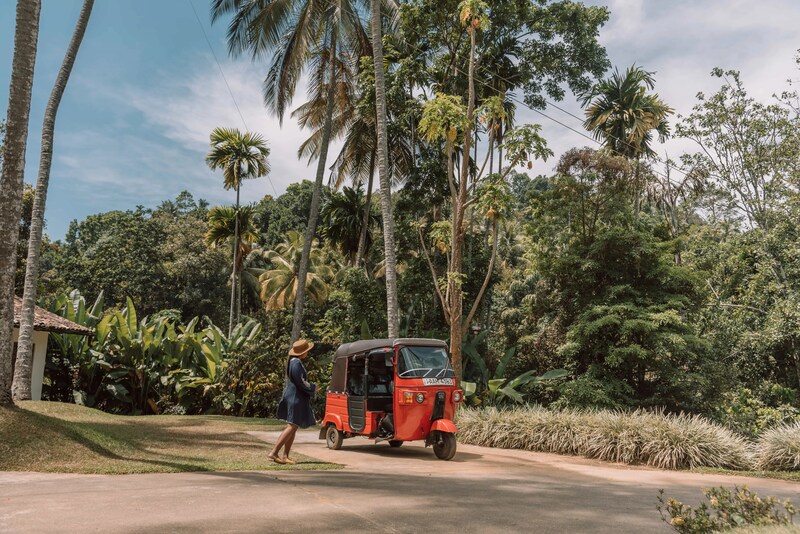 If you’re travelling short distances and/or finding new directions for your trips, then you have to get on a Tuk-tuk, one of the most popular modes of transportation in Sri Lanka. In simple terms, this vehicle is a weird hybrid between a cab and a tricycle; in even simpler terms, it’s a motorized pedicab, but it is definitely a must-try for tourists in this country. However, as a foreigner, one might have a hard time with this one, as being scammed in a Tuk-tuk is commonplace when traveling in Sri Lanka because some drivers like to rip you off of the amount that you have to pay for your fare. For the most part, riding a Tuk-tuk is a nice and fun experience for us, except when we were being overcharged. The local bus ride experience in Sri Lanka was crazy enjoyable, although you might have to stand up and use your balancing skills for the entirety of the trip as they are really crowded and really fast. Bus rides are really cheap and convenient—you can get a long (7 hours) ride for $5 USD, and an overnight ride as well. We rode on these vehicles mostly for going to beaches in Sri Lanka, Hikkaduwa, Unawatuna, and Mirissa. 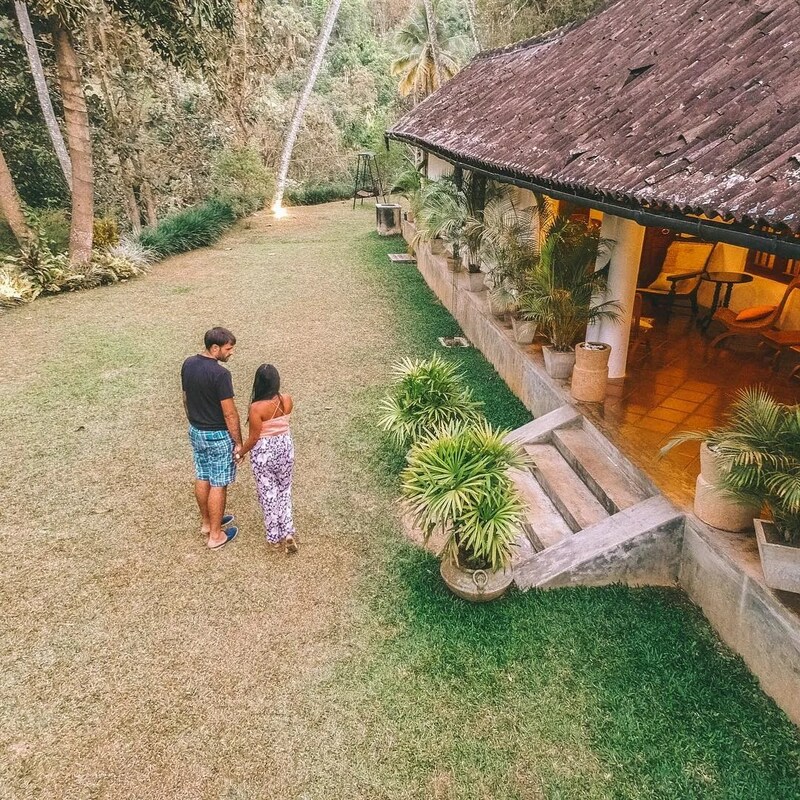 Airbnb (click this link if you want to have 25 Euros disccount coupon in your next booking) is getting really popular in Sri Lanka, and it offers a lot of options. 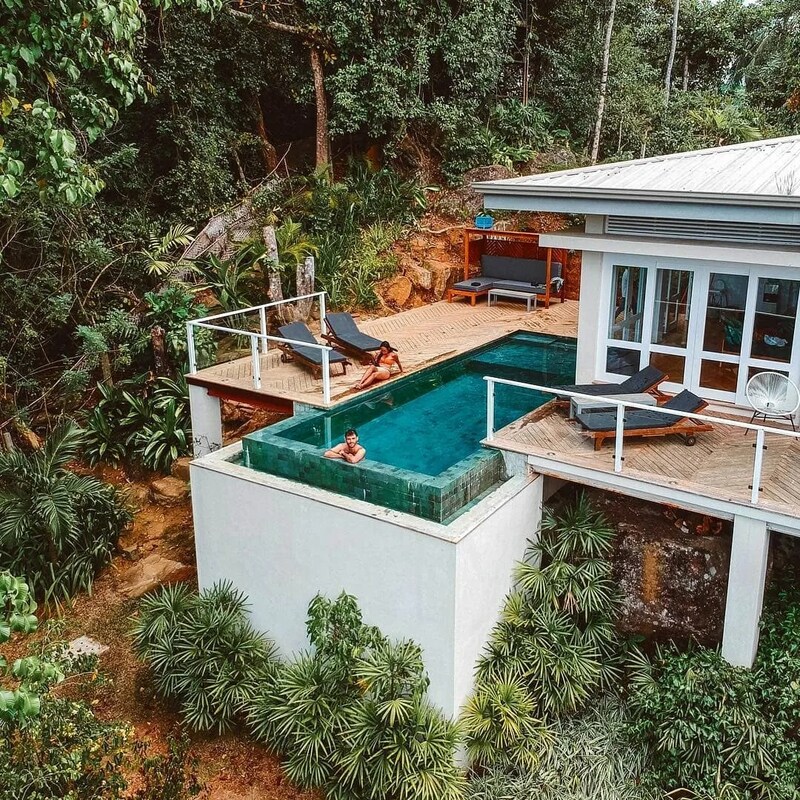 This is where we found our ideal place: a villa near Unawatuna with a amazing pool for relaxation, and fast internet connection for doing our work online. Check out the photos of our villa here. This is our favorite part of Sri Lanka, out of all the other awesome things on our list. We enjoyed viewing beautiful sunsets on the beach, especially the one in Midigama Beach. The colors were really vibrant, and that the place wasn’t that crowded was a plus as well. If you’re an early bird with a penchant for watching the rising sun, then you’re really going to like the sunrise here. The most ideal place for this is Little Adam’s Peak, although you’ll have to wake up extra early due to the hour-long hike to get there. But that’s okay, because the view is truly worth the time and the effort. 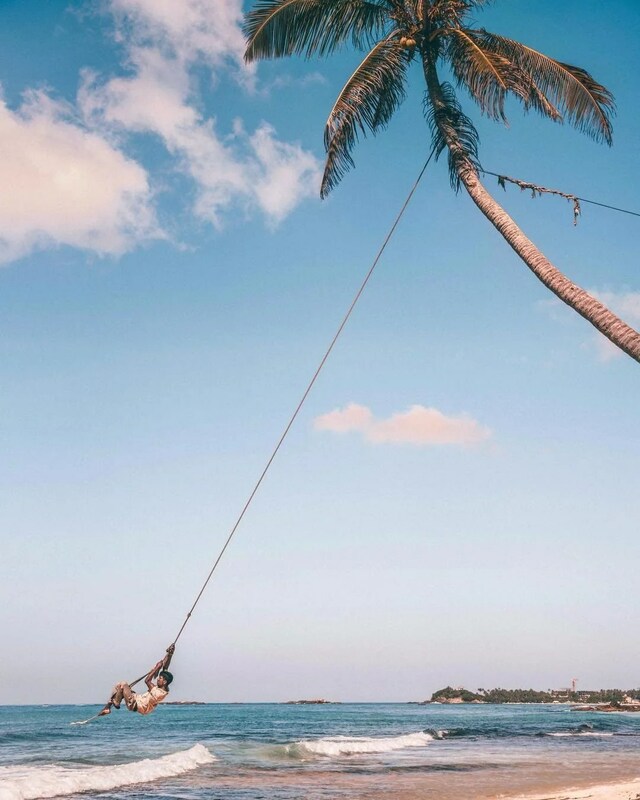 You can visit this well-known swing in Unawatuna, one of our favorite beaches in Sri Lanka. The swing ride costs $3 USD but it’s free if you’re staying at the Dream Cabana guesthouse on the beach. Other than that, you can go for a walk on the long seashore, or simply marvel over the local fishermen’s unique fishing technique called “stilt fishing”. CLICK HERE TO BOOK YOUR ACCOMMODATION IN SRI LANKA BEFORE YOUR TRIP WITH BOOKING AND AGODA! Sri Lanka is brimmed with coconut trees. 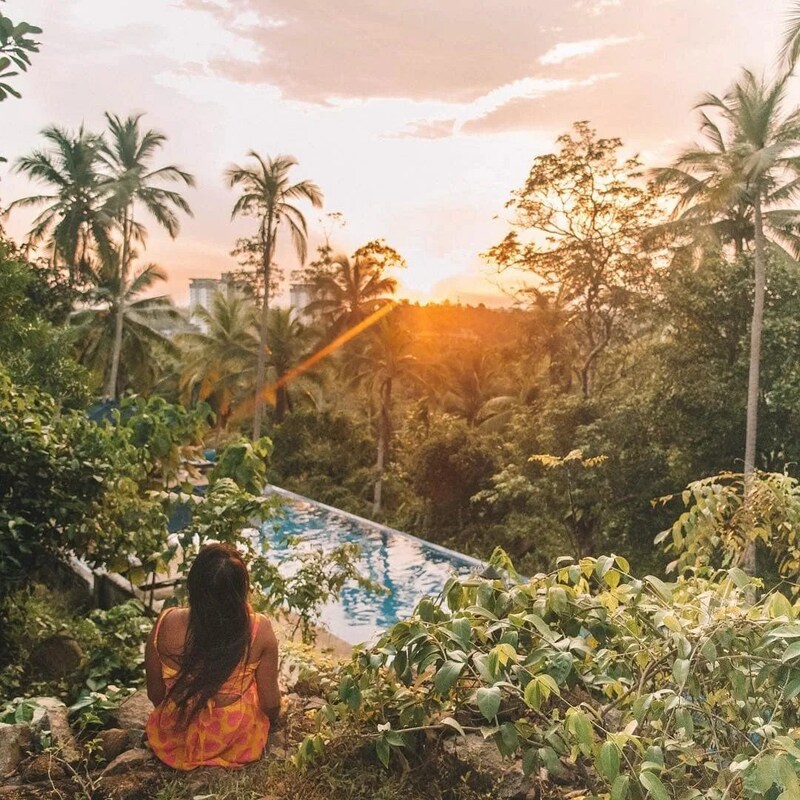 You can practice your tree-climbing skills with them, as the locals do, and you might be awarded with a fresh coconut for your troubles. 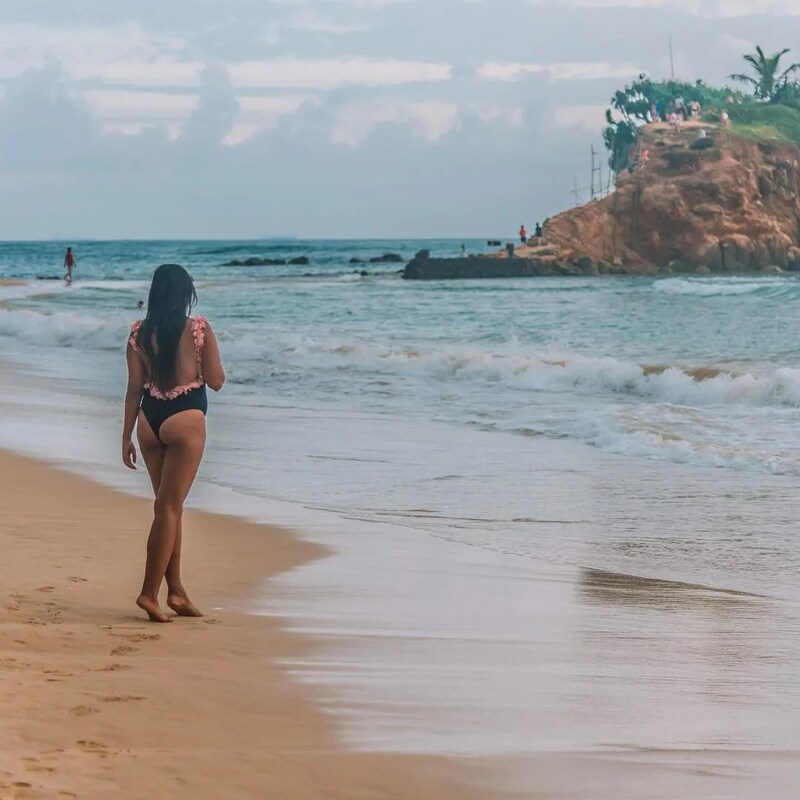 Galle is the main city around the Sri Lankan beaches, and it’s worth a visit if you are within the areas of Mirissa, Unawatuna, and Hikkaduwa. As with most beaches here, the view of the sunset is top-notch. It can get a bit crowded, but that takes nothing away from its majesty. 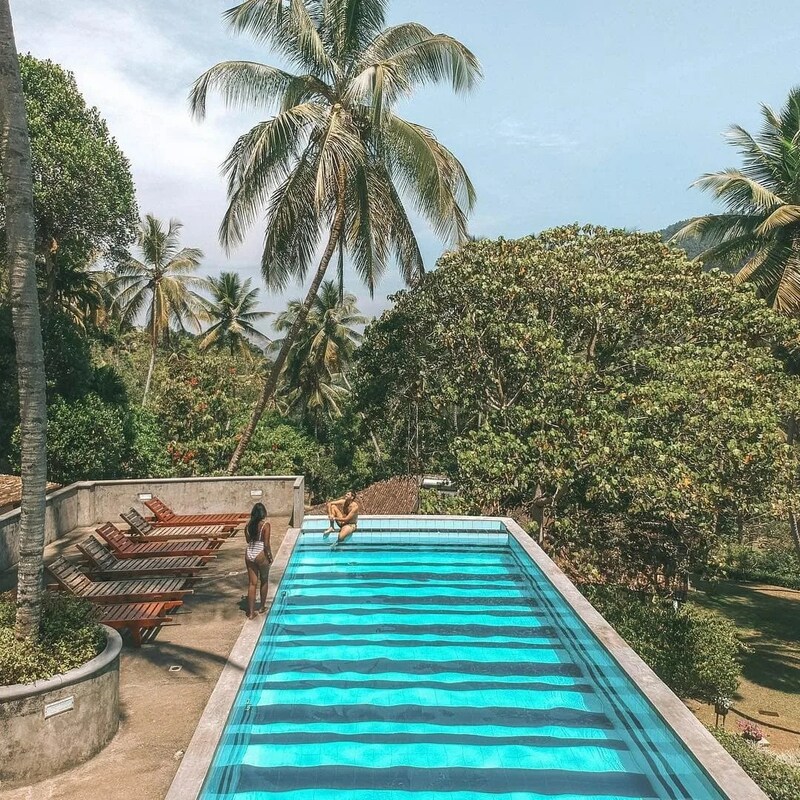 Read here things to do in Galle! If you’re visiting or staying at Mirissa Beach, then you might come across Parrot Rock. All you have to do is walk the sand bar and climb up the rocky steps to get to the top of the small island and the next thing you know, you’re standing atop a great spot to watch the crashing waves, enjoy and take pictures of the beach view, or just relax and have a serene moment. During sunset is the ideal time to go, mostly because this is when it’s the least hot. Another awesome plan to do is whale watching in Mirissa. There are plenty of delightful fruits in Sri Lanka such as the typical mango, papaya, and—of course—coconut, but you can also find exotic ones like rambutan and dragon fruit. However, the most interesting fruit that we came across with was the one that we’ve never heard of and have only found out just then—the wood apple. On the outside, it’s got a really tough shell and quite an interestingly fragrant smell; it’s got a weird, brownish appearance on the inside, but if you can get past this, it’s actually really tasty. “Why is it called a ‘wood apple?” Well, you’re gonna have to Google that one. 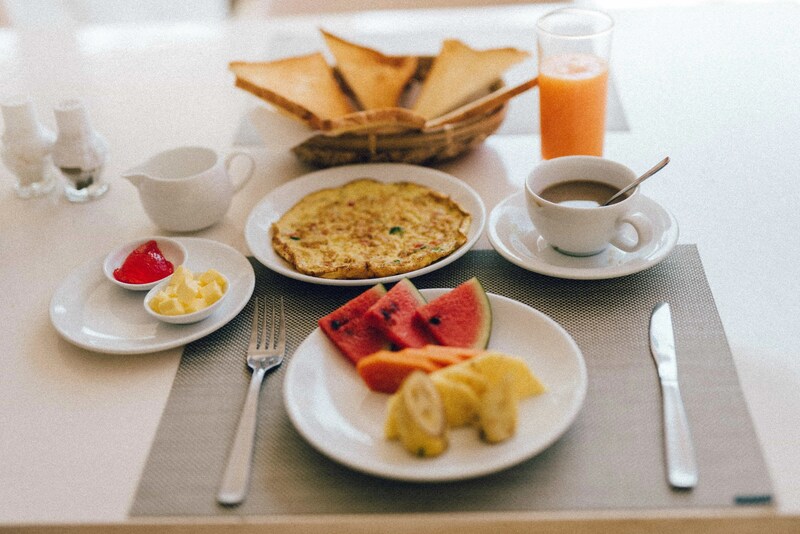 We loved Sri Lankan Omelette so much that it became our favorite breakfast item immediately after tasting it. The dish is made with vegetables and some spicy ingredients, which actually improved it for us. Served with papaya juice with lime, this makes for a great breakfast! One of the most exciting and challenging things on our bucket list for Sri Lanka was climbing Adam’s Peak, and the awe-inspiring sunset once you’ve reached the top is the cherry on top on this activity. So make sure you wear the proper hiking clothes and shoes if you’re up for this adventure. Oh, hopefully the weather is on your side. Good luck! 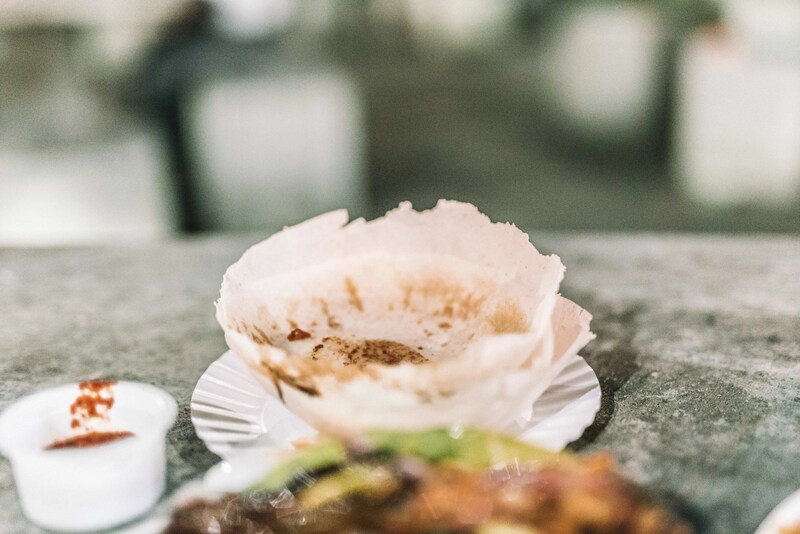 If you’re dining at local places, then you should definitely try these things called Hoppers, which are bowl-shaped pancakes made from rice flour and served with various toppings. The best one that we tried was the one with egg and vegetables, but there are also sweet hoppers if that’s what you’re into. This Sri Lankan delicacy tastes so good that we might just study how to prepare them ourselves. 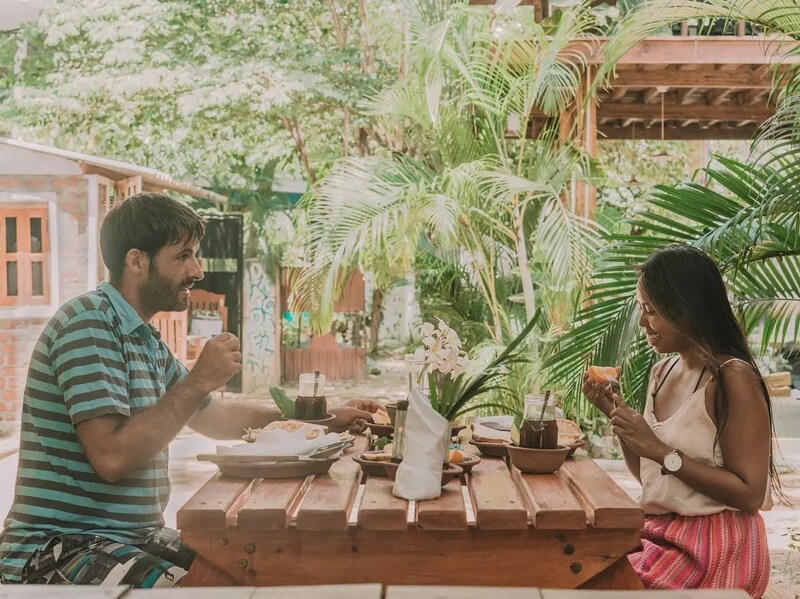 We’re big fans of fresh fruits and juices, and our favorite one from this leg of our travel was the papaya juice with lime. As we’ve stated above, it’s a perfect partner to a Sri Lankan Omelette, but you’ll still love to drink this everyday even without that dish. The locals in Sri Lanka eat roti with curry all the time. The word roti is of Sanskrit origin meaning “bread”, and curry is, well, curry. Put these two together and you’ve got one hell of a Sri Lankan delicacy. People in this country eat this snack frequently; it’s basically a part of their culture—so why not try a taste of this piece of it? Plus, you can even learn how to make it yourself just by watching it being prepared. We visited Madulkelle during our stay, and I can honestly say that the tea that we drank here was one of the best that we’ve ever had. We’re actually coffee people, but the tea that we drank on this day was too good to pass upon, and the stunning view of the place only accentuated the whole experience. If you’re as big on photography as we are, then you’re in for a treat in Sri Lanka, especially for those who own drones. It’s completely safe and you are allowed to fly your drone here. You’ll be really satisfied with the photos and videos that you’ll end up with. Also, based on our experience, a lot of locals will approach you when you’re flying your drone, so get ready to make new friends. There are a few countries where they don’t allow drones. So, if you are ever planning to fly a drone in Sri Lanka, we’re here to assure you that it’s 100% okay! Sri Lankan beaches are very popular, which is why we spent most of our time there. They’re great places for snorkeling. The water on the beaches is crystal-clear, which is a huge positive if you want to see the turtles on the seashore up-close. You can join a tour with other beach-goers, or just rent your own mask and go at it alone. A sari (or saree) is the dress code for Sri Lankan women. It is a long garment usually worn around the waist and draped over the shoulder. This clothing actually symbolizes grace and pride in the Sri Lankan culture, so if you’re invited to a local celebration, you can never go wrong with a sari. 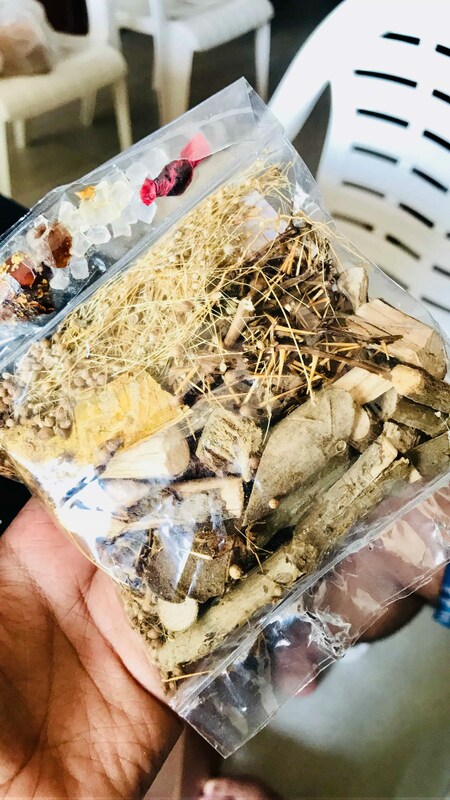 If you ever fall under the weather or feel something as much as a stomach ache while on your travels in Sri Lanka, worry not—you can find a lot of medicinal herbs here, as the locals use them as treatments to their ailments. If you’re the type of person who’s really into trekking, then the marvellous mountain town of Ella has got you covered. You can go for a hike, climb Little Adam’s Peak for the sunrise, and visit tea plantations. Or, why not try and search for those famous Instagram-able places around Ella and take a few snapshots as well? Who wouldn’t enjoy infinity pools? 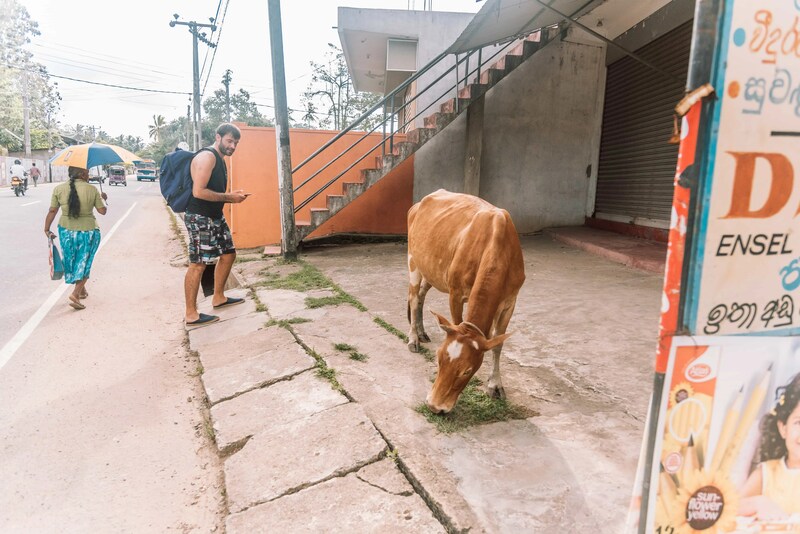 We had a few opportunities to experience these while travelling in Sri Lanka. 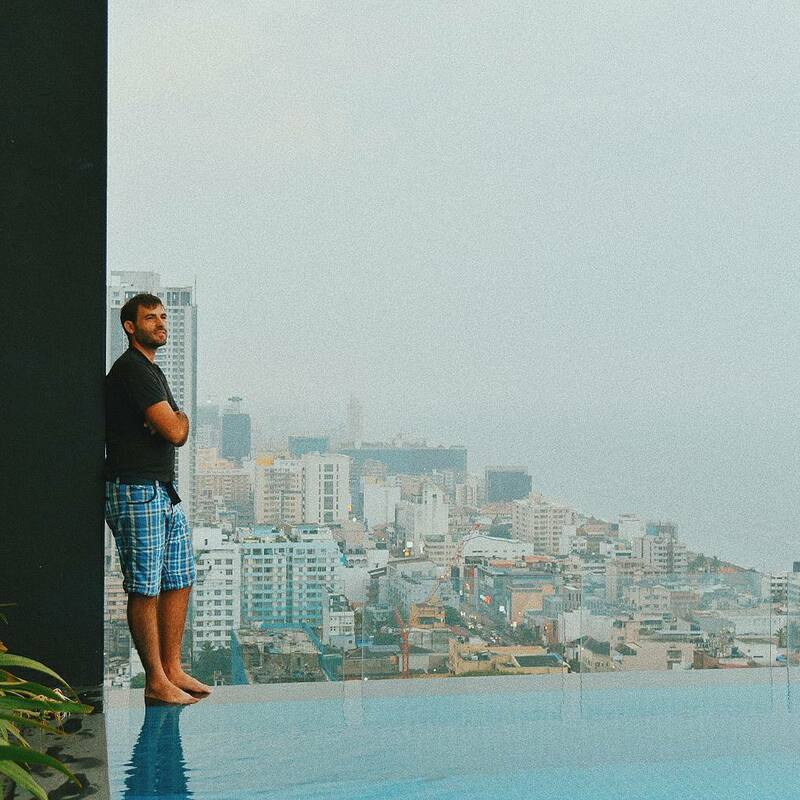 It’s always great to watch the sunset while relaxing, swimming and enjoying some of Sri Lanka’s amazing views! We had a great romantic experience cruising in Mahaweli River. We savoured a wonderful breakfast while sailing around. We could see a couple of swans and flamingos swimming in the river. Isn’t that just wonderful? 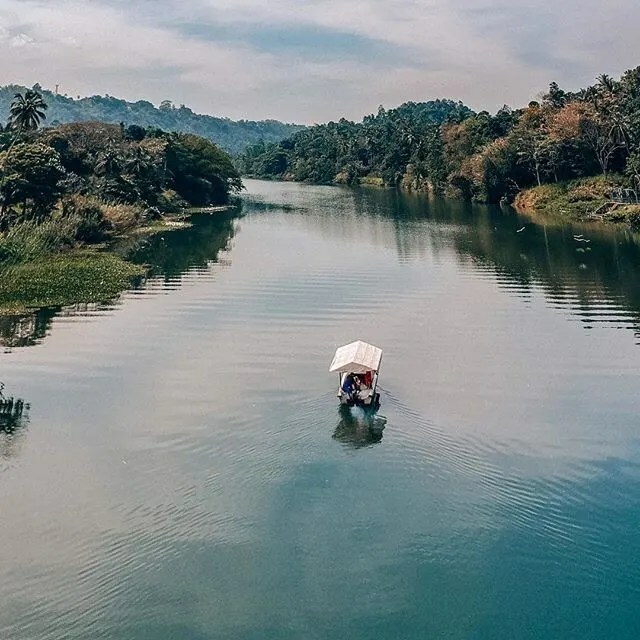 It was a very serene and sublime experience that you can have when visiting Kandy. Also, the service was really great and we had loads of fun! While visiting the beaches in Sri Lanka it would be nice to ride a motorbike. There are many beaches around and if you have the chance to rent a motorbike you can visit a few of them, especially since the distances are just really short. You will find empty beaches and those with fishermen around. You will certainly love the experience! 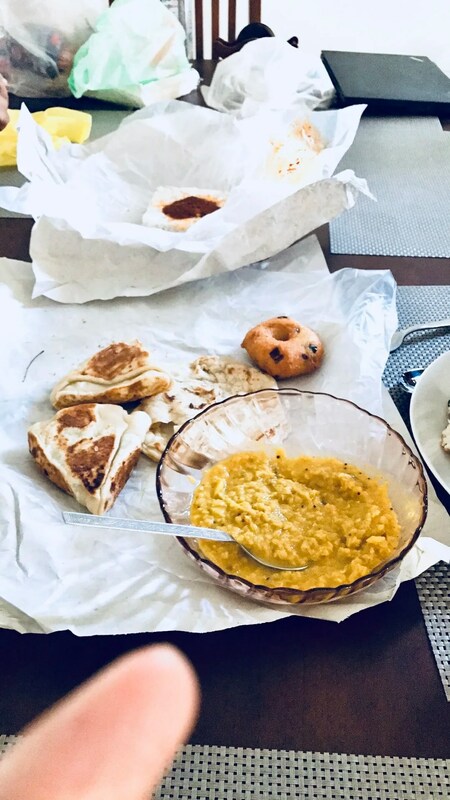 One of the most popular breakfasts in Sri Lanka is the vegetarian roti and you can have it with egg or without egg. It was actually very delicious and the price starts at only 33 US cents! You can easily find them on the streets and in local restaurants. 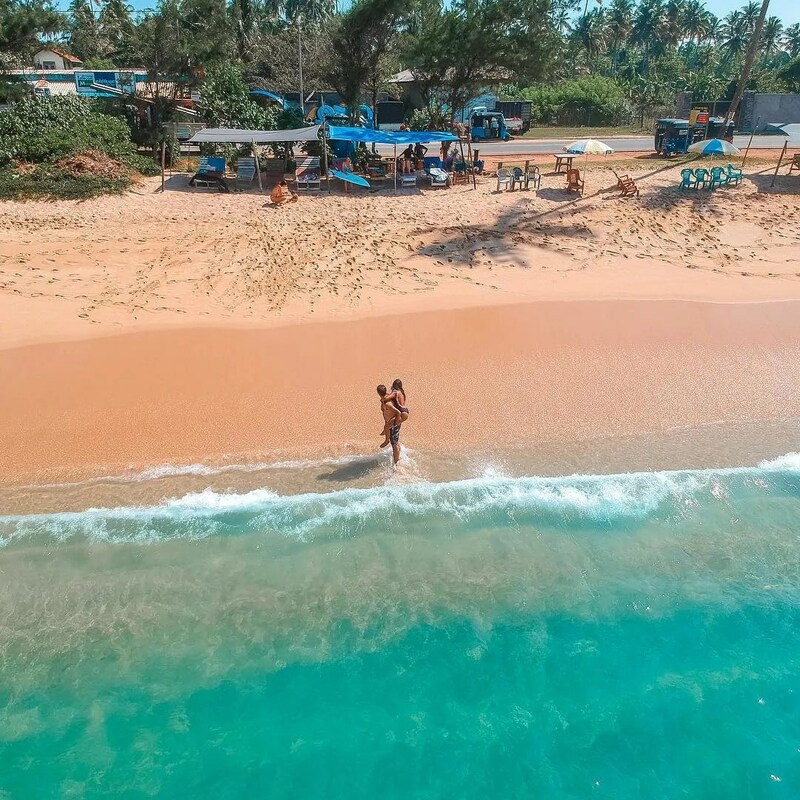 It is said that Sri Lankan beaches are the nirvana for beach lovers and we couldn’t express how much we agree on that. The beaches are so beautiful and packed with tall palm trees. The scenery is perfect for those who love taking pictures while enjoying long walks along the shore. The area is very quiet in general with only a few tourist areas with bars and restaurants. After your walk, you can enjoy a smoothie or a cold beer while watching the sunset. You’re probably wondering… “Kicked out of the bus in Sri Lanka. Why?” Well, unfortunately, it happened a couple of times because we were riding the same distance as we did before but the bus tried to charge us 3-4 times the usual price. And yes, even if the fare is cheap, I protested because I don’t like experiencing that kind of mistreatment. I asked why it was so expensive while during our previous day in Sri Lanka, I only paid less than half of what they were charging us. The answer we get? We get kicked out of the bus! Though this happened twice, it was not a big problem for us. We just took the next bus that arrived and the price was back to normal, luckily. It’s just part of traveling and you have to take note that it can sometimes happen. 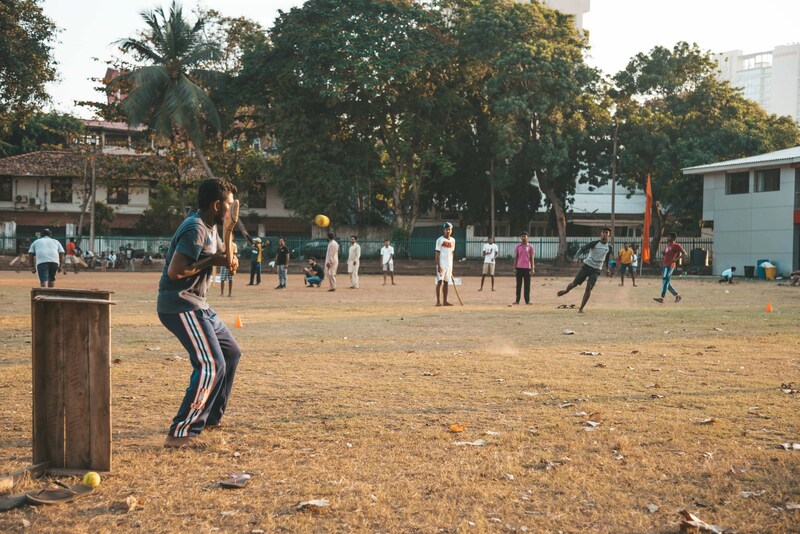 Cricket is the national sport of Sri Lanka and shares some similarity with baseball. You will see kids and adults playing it everywhere. It’s definitely worth it to try if you come visit. I tried it and it really wasn’t that difficult. It’s super fun and local people will be super happy to meet you and get to know you a little. They asked me about Spain and also asked about soccer teams like Real Madrid and Barcelona. We always make sure that we visit local markets everytime we travel. You always have the chance to try their local food and fruits. We also love the vibe in the local markets, we usually go there after we arrive and before our departure. The people are always so busy and it’s easier to haggle for affordable food and items at local markets. We got surprised at how modern and how full of life public parks were in Sri Lanka. Some of them even offer boat rides around the lake though it gets too crowded during the weekends. It’s a perfect scenery to mix with local people. Watching Colombo from a rooftop – what a treat that was! The perfect time is during sunset since you can see the wies with light and enjoy the sunset. And a few minutes later you will enjoy the views at night with the lights on the city. Check out Movenpick Colombo, an amazing place for your stay in Colombo! On February 4, 1948, Sri Lanka has finally gained liberation from the United Kingdom. For this country, this meant taking back their culture and tradition and paving their own way as a united nation. Since then, Independence Day has been celebrated all over Sri Lanka. The day commemorates all the struggles from the past and pays tribute to Sri Lanka’s heroes who’ve helped them achieve freedom and gain their own identity. 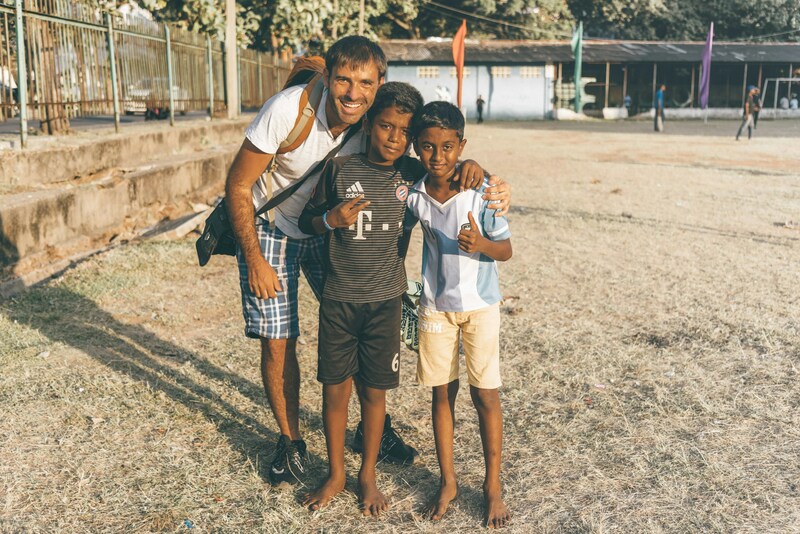 This is the perfect time to experience the Sri Lankan spirit and to see how much the people value their culture. Also known as Buddha Day, Vesak honors the life, enlightenment and death of Gautama Buddha. This religious festival is held annually around May or April by countries like Sri Lanka, Singapore, Indonesia and Thailand. This day allows Buddhists to decorate the streets with lanterns and to give back happiness to others, especially to the less fortunate. You can find many devotees giving away free food in the streets of Colombo, Galle, Kandy and other parts of Sri Lanka. At the end of the harvest season and spring, Sri Lankans celebrate Sinhala and Tamil New Year by wearing their best clothes, anointing children with oil, lighting up fireworks and performing their rituals. It is not only a Buddhist and Hindu celebration but also a way to honors Sri Lanka’s heritage and history. It is held during the 13th and 14th of April as these days mark the journey of the Sun from Pisces to Aries in the Zodiac. The rituals during this New Year are executed at a precise time based on astrologers and in reverence to the Sun. If you’re planning on visiting Sri Lanka on a low budget, transportation will not be an issue. And you can find accommodation starting from $10 USD. Click here to find those deals! If you liked the post, please share with your friends on Facebook, Pinterest and let us know more amazing things to do in Sri Lanka! Also, click on these links if you’re planning on taking a trip to Maldives, Malaysia or Thailand on tight pockets. Wonderful photographs. You showed the entire Sri Lanka in one post..